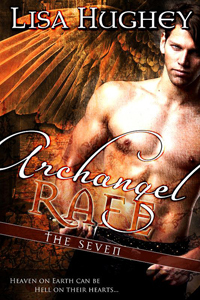 Lisa's new book Archangel Rafe (A Novel of The Seven) is out now! Just thought I'd let you know that I have a new book out. Working on this book was an amazing journey. The beginning: I wrote the original story a few years ago and my agent submitted it to the publisher I had specifically targeted. Ultimately they turned it down but said they would look at a revised version, if I made the heroine younger with no children and less responsibility. The middle: I re-wrote the book and changed the heroine. I made the plot stronger and more epic. Unfortunately, they turned it down again. But now I had a heroine that even I wasn't crazy about. The end: I worked with Theresa Stevens, editor extraordinare, who consistently pushes me to be a better writer. I am blessed to have her input and direction. And this book is the result. Angelina. What I love about Angelina is that she's got some life experience. She's about to be divorced. Has two teenagers. A sister who is a little on the needy side. An ailing grandmother who raised her. Her life is plenty full. And all she really wants is a little peace and respite from all of her responsibilities. She starts having these dreams. Hot dreams. About an angel. And in her dreams is the only place she can escape and be free of responsibilities. Except her dream angel turns out to be real. And when he starts talking rare healing powers and a responsibility to help people she shuts him down. She doesn't have time to take care of anyone else. She doesn't even have time to take care of herself. Rafe is the Archangel of Healing. He's pretty much had it with the human realm. He's frustrated and disillusioned with people. He's actually one final act away from leaving behind the human realm and ascending to the Second Sphere of the Angelic Realm. He just has to get Angelina to accept her power and begin healing. Take two determined protagonists whose goals are at total odds, throw in a very steamy and completely forbidden attraction and the sparks fly. Archangel Rafe is available at Amazon, BN and AllRomance eBooks. If you like it, please leave a review on one of those sites or Goodreads. Without the might of a publishing house behind self-published books, authors have to rely on word of mouth to get a distribution channel going. We are eternally grateful when people review our work!! Also, huge thanks to Kim Killion (Hot Damn Designs ) who did an amazing job on the cover! !